I am not a big fan of granola. Usually it is…meh ok, nothing special. How fancy can you get with some oats a few nuts and something to stick it all together. It usually seems to be overly sweet or bland like biting into a lumpy piece of cardboard. C’on fess up how many of you have felt like they were going to break a tooth on a store bought granola bar?? I know I have, a LOT. So how do you fix something that normally has to reach up to touch the bottom of average? You turn to Cooks Illustrated! I know you are wondering what I have been snorting aren’t you? But seriously they are the king of testing, to work for America’s Test Kitchen would possibly be a dream job with the way I love to pick things apart. Knowing the how and why two items interact like they do is like tossing a steak to a lion for me. 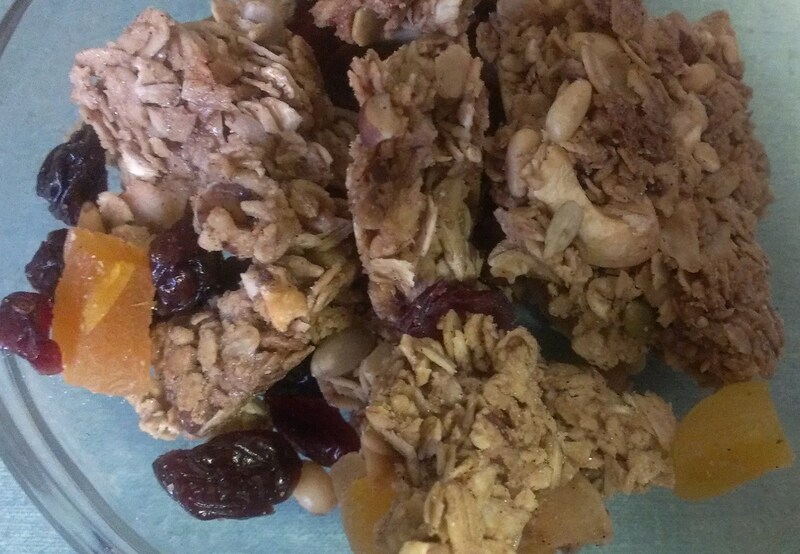 A few months ago they did an article on granola talking about some of the hoops the writer had gone though to combat the different issues in making a tender lovely plank of tasty oats and nuts kissed by dried sweet fruit. 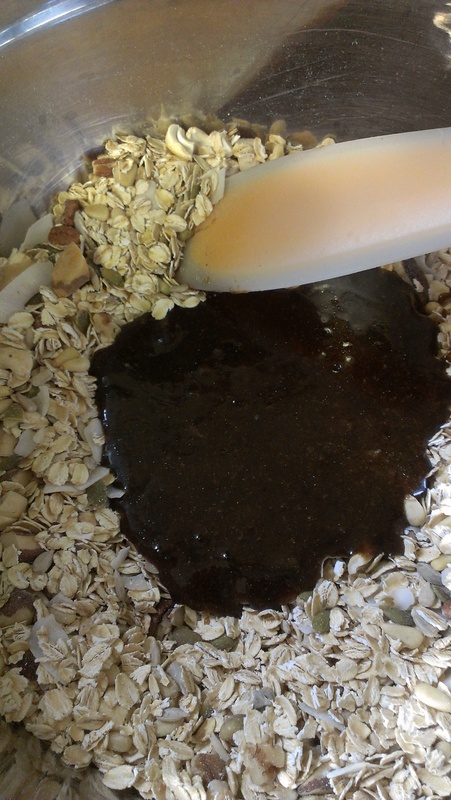 One of the things the writer found that you had to use more oil to give the mouth feel of moistness not less, that dried fruit worked best when added after then baking process because they dry out and turn to stones if added into the oats and allowed to bake in the granola at the same time. 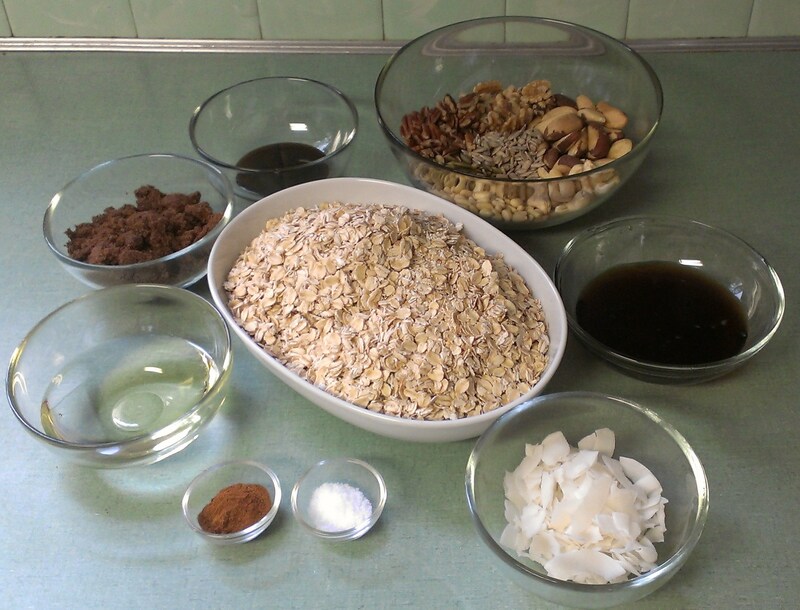 So being twisted the way I am I could not leave well enough alone, I had to tweak their perfectly fine recipe knowing I could take what the writer has learned and build a better granola to offer to those who find themselves on the regular WikiJan feeding schedule. Did I reach my objective? Well lets just say there is a bit of squawking amongst the Work Peeps when I bring it in. 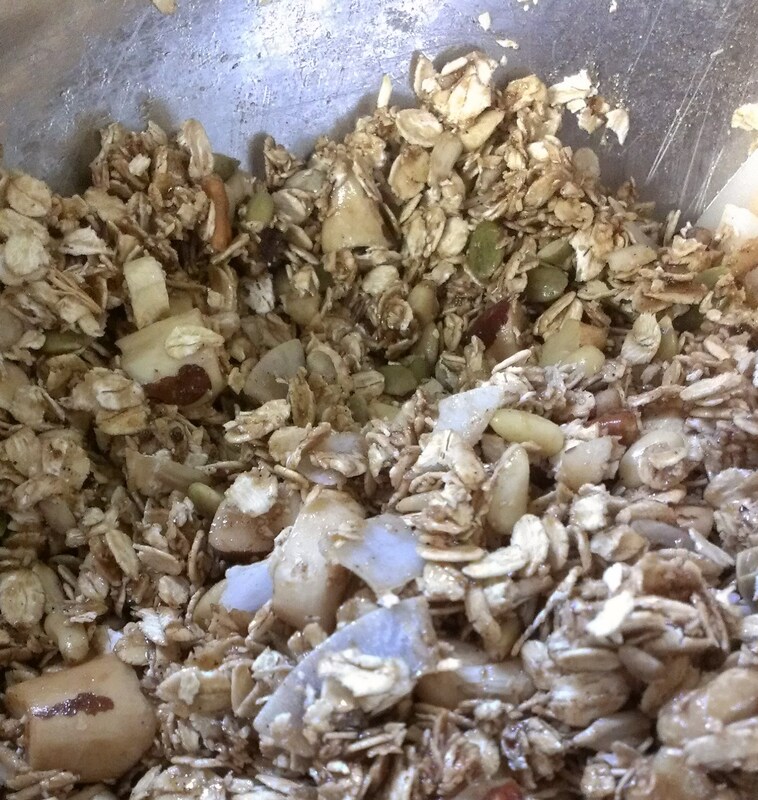 Kathryn D and The Hungry Neophyte really got me to thinking about granola -Kathryn D. because she was having issues getting her granola to stay together and The H.N. 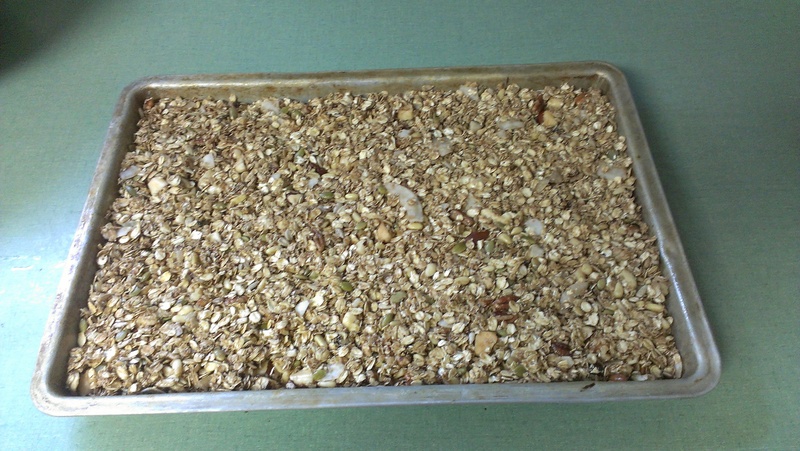 because of his love of a good granola….so I took the C.I. recipe and gave it a WikiJan twist. First thing I did was replace the vanilla extract with vanilla bean paste. Doesn’t seem like a big deal but I was surprised to hear some of the comments from my Boys and The H.N. that one batch which I did without the vanilla bean paste tasted good but different to the point that they asked me what I did different. I couldn’t think of what I had done differently until I hit upon the vanilla. I also changed out the brown sugar for muscadavo brown sugar, more flavor punch. With the maple syrup I love using grade “B” which is a much darker more…robust maple flavor. 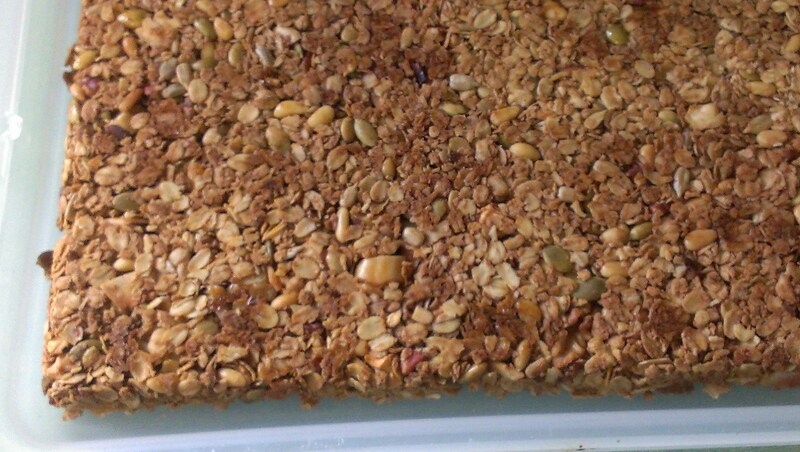 All of which helped the flavor profile stand up to the oats and nuts I choose to use with each batch. The thing I love about this recipe is the ability to swap out nuts and fruit to suit my fancy at the moment or to what I have on hand. I can add spices as I like – no problem. The only thing I have found that you have to be a bit careful with is adding coconut flakes. If you do, try to find a wide cut flake that is on the dry side meaning there is less sugar added to it. If its sticky you will run the risk of it burning during the long bake time. The only special tool you will need is a flat solid spatula to press down the mixture once it goes into the cookie sheet. But all is not lost if you don’t have one just use a piece of Saran-wrap and press it all together it will work just as well. 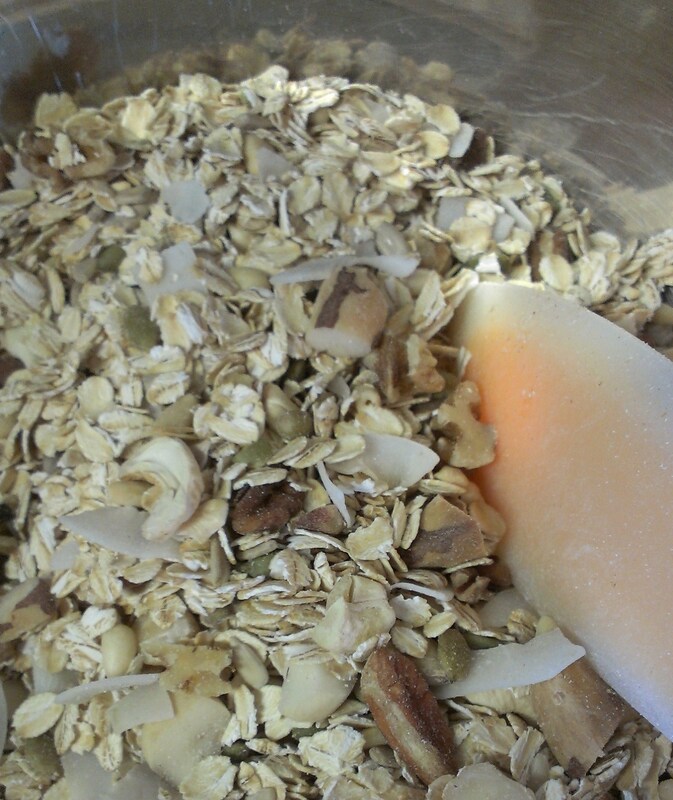 Rough chop any larger nuts you are adding then toss in oats, nuts, coconut if using and stir together. 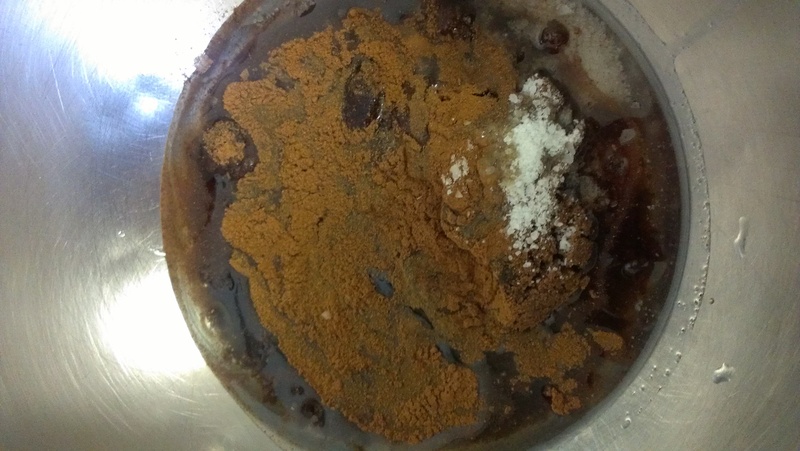 In a separate bowl mix together oil, sugar, maple syrup, salt, vanilla and cinnamon if using mixing well to combine. It will be a thick-ish mixture when you are finished. Pour brown sugar mixture over the oats and nuts stirring very well to distribute the brown sugar over all the oats and nuts. Pour into a rimmed cookies sheet. You can line the cookie sheet with parchment paper or use a non stick spray, either one will work. Press down firmly with a flat spatula or cover with plastic wrap and press with the palms of your hand to compact down. Toss into the oven set at 325 for 45 minutes turning half way though the cooking time. Remove and allow to cool then turn out, once cool break into chunks then GENTLY toss in any dried fruit chocolate chips or what have you. Now do not blame me if you plow though the whole pan in less than 2 days. Glad to see a new commentary from wiki jan. This granola is outstanding! I know I know I am a bit slow getting things post this summer. But on the plus side you have ricotta gnocchi, pork breakfast sausage, and ribs to look forward to over the next couple of weeks. I just need to tweak a few things before posting them. So, these are your famous oats everyone raves about?!!! YUM! Looks delicious, and I can’t wait to try the recipe! If they are half as good as your meatballs, I will love them! Haha! Thank you, Jan! Yes those are THE oats the boys talk about at the store. They are super easy to make. I like a bunch of different nuts in mine but you can use just one. I think for the photos there are 7 different nuts as well as the coconut. Let me know how they turn out for you. Hahahahaha Kathryn you crack me up…or you could just ask me to bring you the rest I have at the house.